Sometimes it pays to follow where the family dog leads. One day after school in spring 2016, Adam Braun was taking Roxie, his family’s German shepherd, for a walk down their street in Locust Valley. As they passed a dense thicket near their house, Roxie began straining on the leash, pulling Braun toward the side of the road. “I thought she might have seen a squirrel or something,” Braun recalled. Adam Braun reads a pair of the gravestones standing in the family cemetery that he helped to restore from overgrown brush and fallen trees. 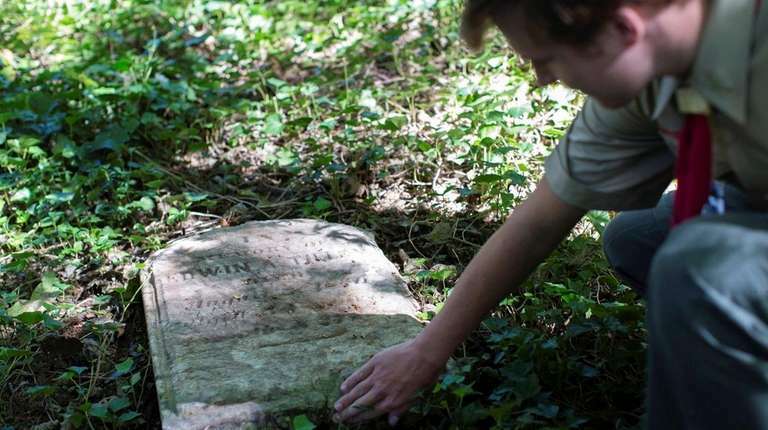 Photo Credit: Adam Braun reads a pair of the gravestones standing in the family cemetery that he helped to restore from overgrown brush and fallen trees. When he followed her to the lip of the tangled underbrush, he saw something sticking out that he had not noticed before: rectangular-shaped pieces of stone. On closer examination, Braun realized they were headstones. Many of the inscriptions were faded, but some were clear enough to read. To Braun’s surprise, they dated to the 1700s. Neither, apparently, did almost anyone else. Left to right, Troop 962's Adam Braun, Michael McMahon, Scout Master Bob Braun, Will Fitzgerald and Matthew Braun with Roxie the dog. 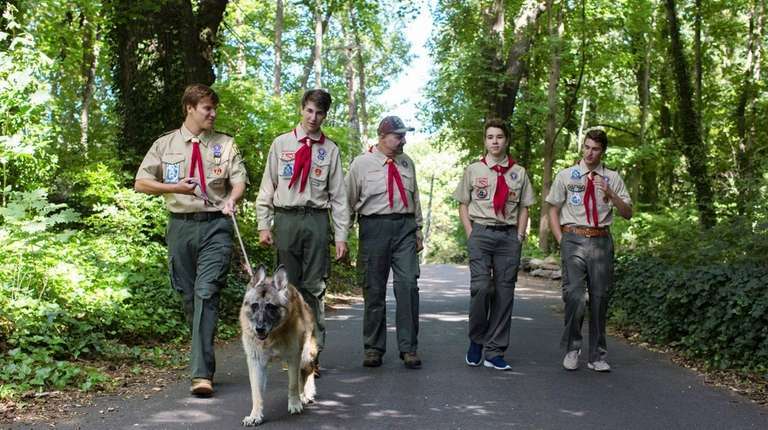 Photo Credit: Left to right, Troop 962’s Adam Braun, Michael McMahon, Scout Master Bob Braun, Will Fitzgerald and Matthew Braun with Roxie the dog. Kaintuck Lane, the street on which the Brauns live, is a quiet, one-lane road that runs about two miles east from Oyster Bay Road to its terminus at the Beaver Dam Winter Sports Club. Traces of the past are all around, including an old path that winds through the woods behind the Braun house and is believed to be part of a stagecoach route that once ran along the North Shore. Braun — an honor student who also runs cross-country and track at Chaminade and plays the viola in the school orchestra — has been involved in scouting since first grade. He and his fraternal twin brother Matt have risen to Life, the second-highest rank in the Boy Scouts. Their father is also their scoutmaster at Troop 962 in Locust Valley. The next steps in the cemetery project unfolded slowly, as Braun had to juggle his new role as amateur archaeologist with school and other responsibilities. First, he had to determine who owned the overgrown plot, which sits between two houses. Using tax maps and records at Town of Oyster Bay offices, he eventually learned that the burial ground was not on the property of either of the homes. Further investigation revealed that the collection of headstones on Kaintuck Lane was listed in town records as an abandoned cemetery for the Tilley family, early settlers in what was originally called Buckram (according to the Locust Valley Historical Society, it was not until 1856 that the town’s present name was adopted, in recognition of the many locust trees in the area). Local historians were aware of the cemetery, but had not investigated it. 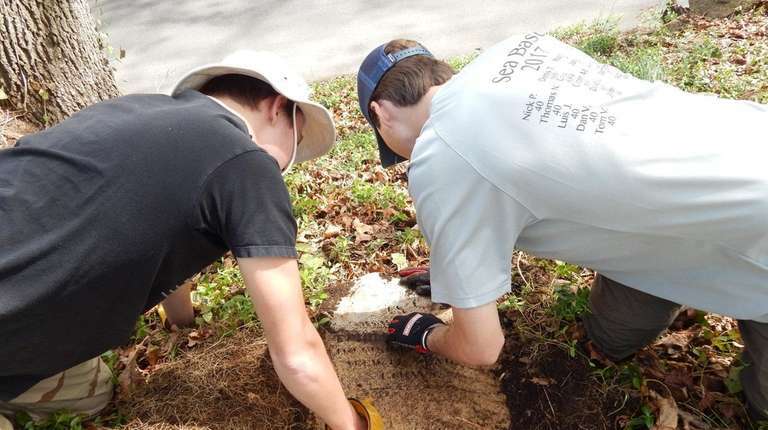 Braun told the historical society that, for his Eagle Scout project, he planned to change that: With the help of his fellow Scouts in Troop 962, he would clean up the overgrown site. “We were thrilled, thankful and grateful,” said Driscoll. This past summer, Braun, his father and the members of his troop, along with the fathers of his fellow scouts, spent six weekends clearing out the 6,000-square-foot area, which was thick with underbrush, and a dead 50-foot tree was removed by the Town of Oyster Bay. During their daylong work sessions (sometimes held on both Saturdays and Sundays), the Scouts and their fathers would typically fill 20 to 30 large contractor bags with weeds, leaves, dirt and dead branches. 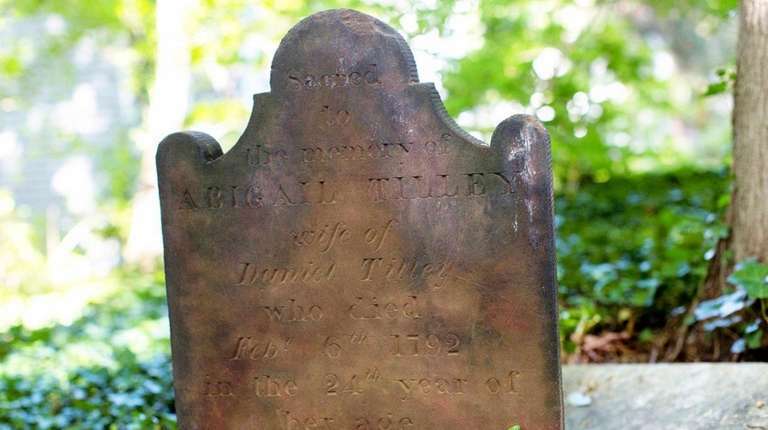 The headstone of Abigail Tilley is clearly readable after brush and fallen trees were removed from the site. Photo Credit: The headstone of Abigail Tilley is clearly readable after brush and fallen trees were removed from the site. 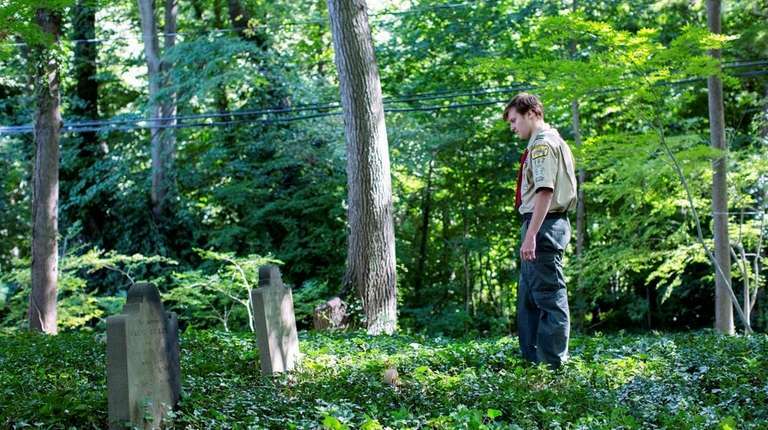 The Scouts uncovered 17 headstones, dated from 1775 to 1865. Many had fallen and were partially buried under layers of dirt. They were also able to brush off some of the old stones, making their epitaphs legible. 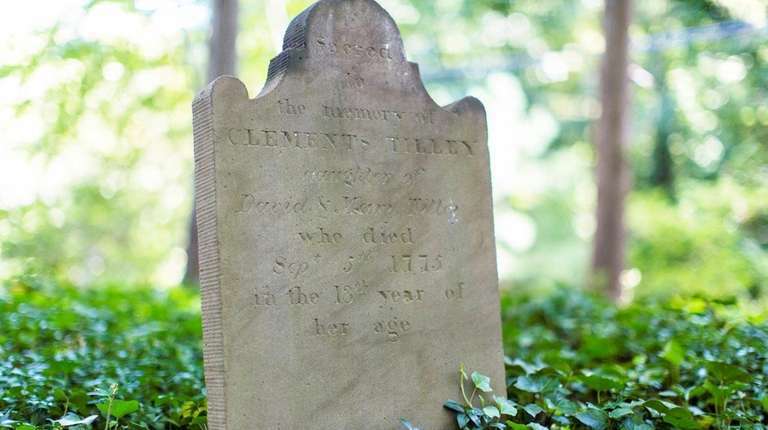 Next to Jacob’s stone is that of his 18-year-old sister, Clements, who died Sept. 5, 1775. Clements died five months after the battles in far-off Lexington and Concord sparked the American Revolution. Her brother died two months after the decisive Battle of Yorktown that effectively ended it, six years later. 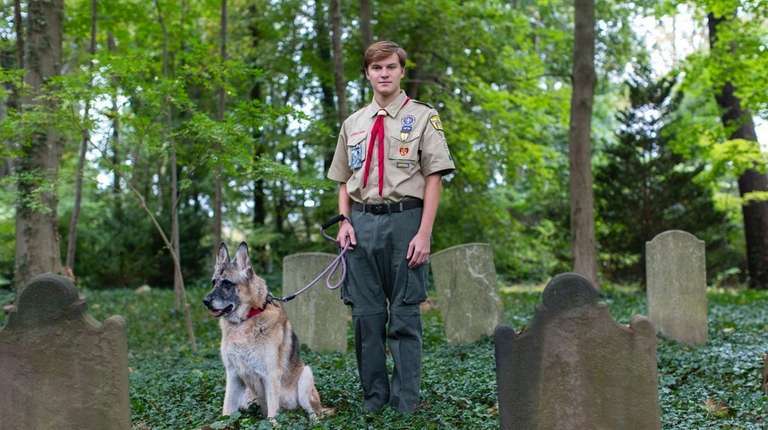 On a warm Saturday this past September, Braun, his parents and brother, two local historians and some of his fellow Scouts and their parents paid a visit to the cemetery they had spent much of the summer unearthing. The boys had varied reactions to the idea of having uncovered a burial ground in their neighborhood. “It’s a little creepy,” said Matthew Braun, Adam’s twin. Fitzgerald said the experience was eye-opening, particularly the headstones of the Tilley siblings, who would have been near his age in the 1700s. 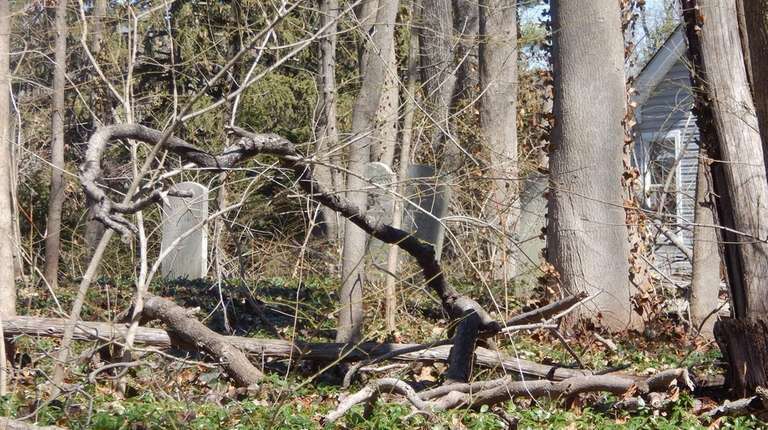 According to town historian John Hammond, there are 121 historic cemeteries in the Town of Oyster Bay, many of which are in residential areas and many of which have been abandoned over the years. Under the Town of Oyster Bay’s Adopt a Cemetery program, civic or service organizations agree to care for a particular burial ground with support and advice from the town. The care will include clearing brush, weeds and debris from the cemetery several times a year. Hammond helped guide Braun through his research, and even managed to connect him with a Tilley family descendant in the Washington, D.C., area who has expressed interest in helping to maintain the plot in the future. The restoration of the cemetery is now concluded. To fulfill his Eagle Scout requirements, Braun compiled a thick portfolio of documents, photos and supporting materials detailing his project. It will be reviewed by a committee of local scouting officials, who will also interview Braun in person about the project. If all goes well, he will earn the Eagle Scout rank by the end of the year. As he toured the site in September, Hammond pointed out some of the stones that had fallen and, at his suggestion, had been cleaned off by the Scouts but otherwise untouched. As Roxie, the Braun family dog, sat contentedly on a bed of English ivy, sniffing the late-summer air, Hammond said that he hoped local history buffs and descendants would now be able to visit the cemetery, which he hopes remains free of elaborate fencing and signage.